If you are a regular reader of this blog, you’ll know that I am a big supporter of food that is locally grown, and seasonal. I also tend towards food that is made from scratch, with whole ingredients. But it occurred to me that I may never have actually shared why I have this philosophy. 1. Supporting local businesses is something that has always been important to me. I’m a business owner. I have been self-employed for 7 years, and so it’s always been my philosophy to support other small business owners. When you support a local business, the money stays in your community–when you spend in your own city, that translates into others spending in the city, and so on. Ideally, I want to support my own local businesses, not huge corporations that will take money out of my community. 2. Local businesses tend to be more sustainable and green. Large factory farms tend to have less sustainable business practices, and will also use more chemicals when it comes to growing their crops. Local farms, even if they aren’t organic (per se) are smaller, and use less invasive growing practices that will be better for the environment in the long term. 3. Locally grown food tastes better. When I cut into a strawberry that comes from California, it’s white inside and it has no taste. When I eat a locally-grown strawberry–it’s delicious and sweet and red all the way through. 4. Locally grown food can save you money. If you buy in bulk when something is in season and then preserve or freeze it for later, you can save quite a bit of money. 5. Local farming creates less waste. Vegetables feed animals, and then animal waste feeds the vegetables. It’s for these reasons that I try to source much of my food locally, especially in the summer, when the farmer’s markets are open. 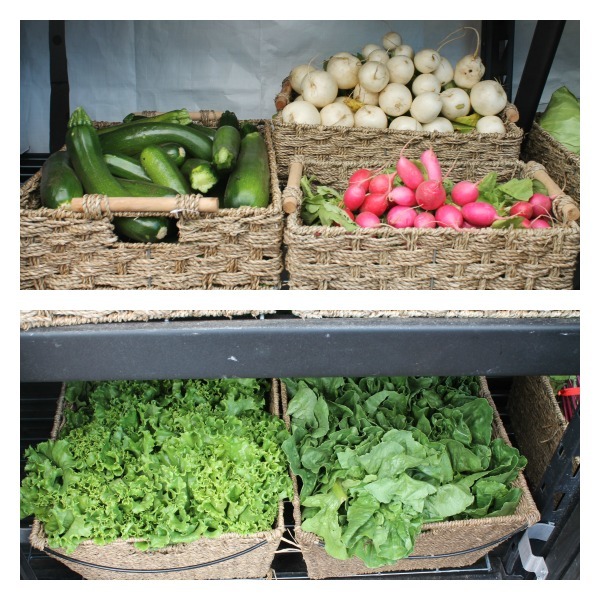 Another option for sourcing locally-grown food is to go straight to the farm itself. If you live near the Valley, you have more options, but if you live in the city like me, your options are slightly more limited. I often drive out to Richmond for my produce, but there are other options, as well. 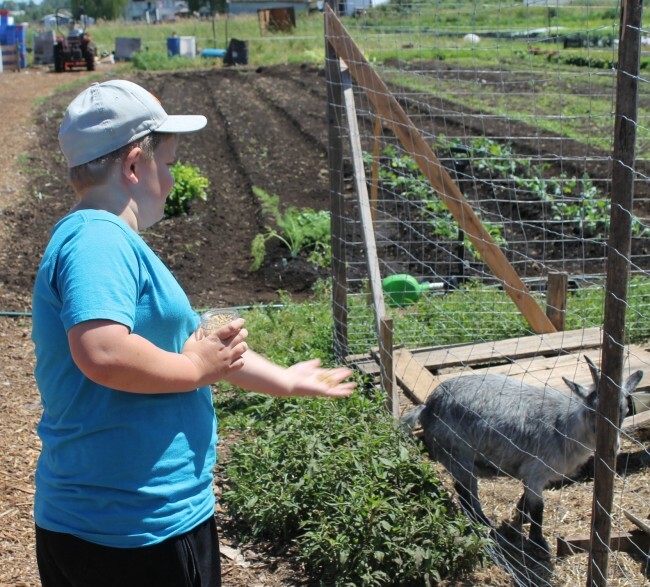 Urban Digs Farm is a working farm inside the city limits. 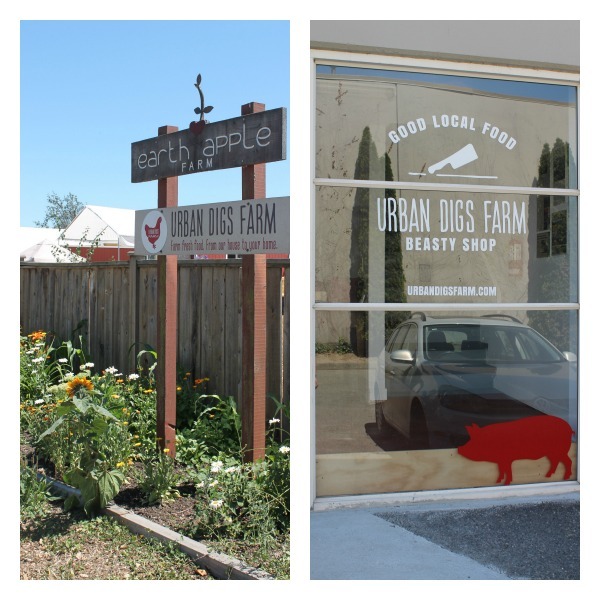 Located just off Marine Drive, between East Vancouver and Burnaby, the farm grows produce and also ethically raises pigs and chickens. The pigs are eventually slaughtered and their meat is sold, and the chickens produce eggs, which the farm also sells. They recently opened The Beasty Shop, where they will now be able to process their own pigs (and act as a kind of butcher co-op for other farmers as well). 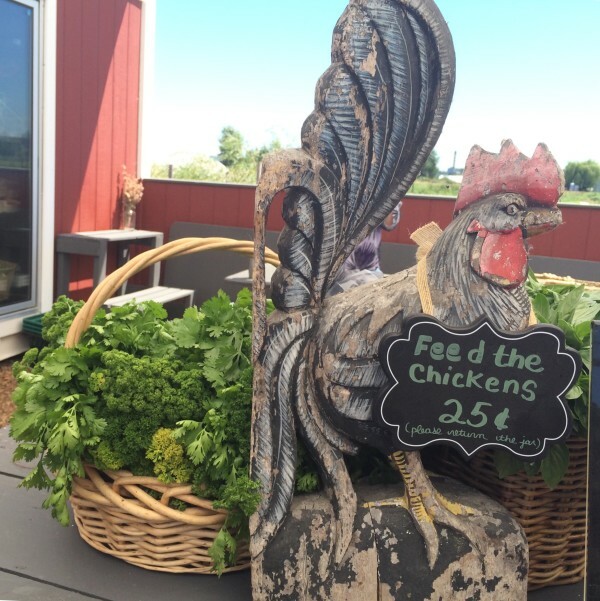 It’s all a part of Julia Smith’s (the owner) vision to have a sustainable, ethical farm, where everything is done according to her very high standards, from beginning to end. And the quality of the final product shows that she is very much on the right track. 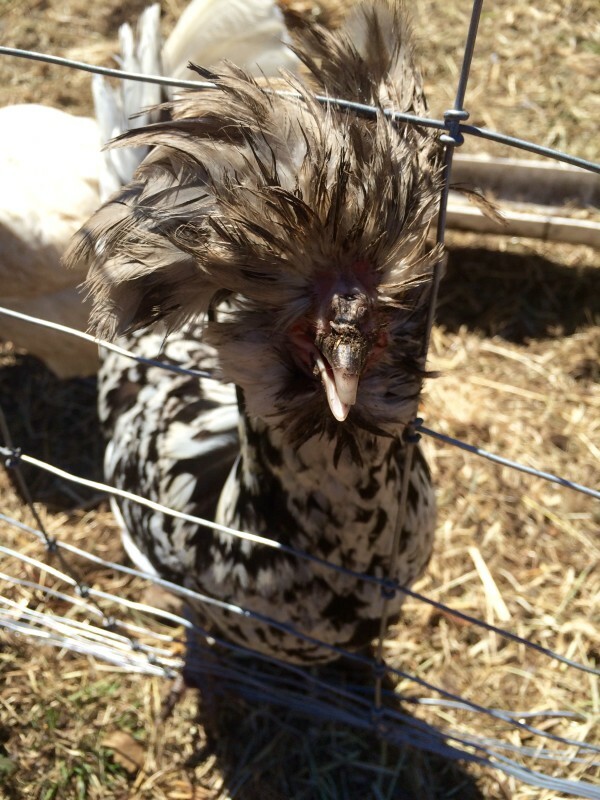 I recently had a chance to visit the farm, and it was a really fun day. I brought Michael. As a city kid, he got to do some things he never gets to do, like feed chickens. 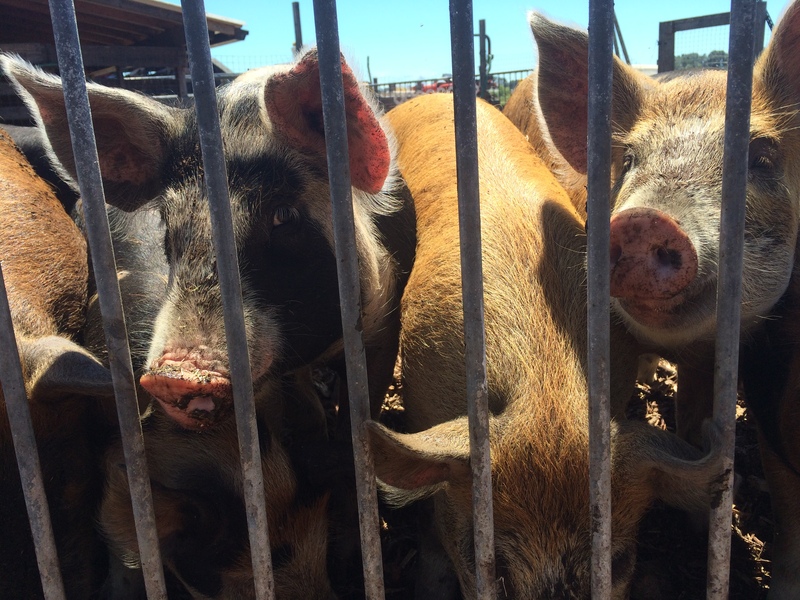 I think it’s an important question to start asking: where does your food come from? Today, it feels like we’re so distanced from our food. It is processed, packaged, and it shows up in the grocery store. To me, there is something romantic, in a way, about getting to know your food, to know where it comes from. I’m not planning on chucking my city life and moving to a commune any time soon, but I feel like asking these kinds of questions is a great start towards a healthier, more sustainable diet.